from September 1939 to April 1945. 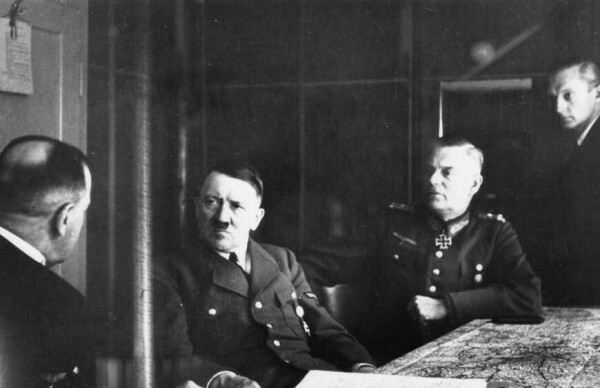 From left to right: Admiral Raeder, Adolf Hitler, Wilhelm Keitel and naval adjutant von Puttkamer. Presented in this page are all important conferences that took place between the Führer and the Commander in Chief of the Kriegsmarine between 1939 and 1945. These documents, together with many other German Navy files, were captured by the Allies at Tambach Castle near Coburg in April 1945, and can now be found at the U.S. National Archives and Records Administration. For the most part the documents translated are the result of notes taken for the head of the Kriegsmarine during his meetings with Hitler. After these notes were subsequently typed, they were signed by Grand Admiral Raeder (Dönitz from February 1943 to April 1945).